Born into a world of silence, Charlotte has always been made to feel inferior to her sister in every way. When her father demands she take Charity's place in a bride exchange on another world, Charlotte decides to embrace her future and hope for the best. She knows it's her last chance to find happiness, and she'll do anything to grab it with both hands. Borgoz agreed to see the young girl married, but the ethereal woman who steps off the shuttle holds him spellbound. She's everything he's ever wanted, and the one thing he can never have. His job as Chief Councilor of his world is too demanding to give him time for a family of his own -- but that doesn't stop him from wanting her. A moment of passion flares bright between them, and unbeknownst to Borgoz, has lasting consequences. When Charlotte returns to her world, he's devastated and realizes he's lost the one thing he wants most. Will he buck the rules of his planet and go after Charlotte? Or will he live with the heartache he feels as the memory of her touch haunts him? 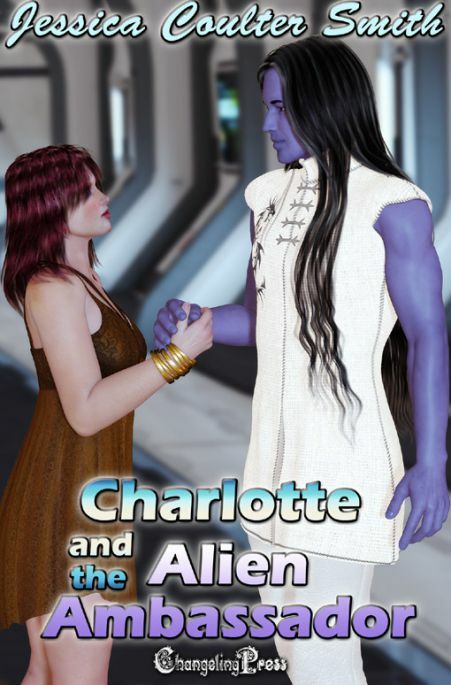 "Life wasn't kind to Charlotte until she meets Borgoz. I was happy that Borgoz saw how special she was right away... readers will enjoy this look into anther Terran love story and hope for more." "I have been enjoying this series of light, fun romances, and I liked this one as well. Love will find a way." "I dearly loved this book. Jessica Coulter Smith has written a very sweet, sensual, and heart warming read. I adored Charlotte and how her character was written with so much strength despite being deaf. The chemistry between Charlotte and Borgoz are off the charts. It was such a sweet read." "Are you Charlotte Mayweather?" the male asked. She nodded. "Why can I understand you and not anyone else?" "I, along with quite a few other males on this planet, have learned your Earth English. However, to make sure you can understand everyone around you, I'm going to implant you with a translator. I'll also implant you with a sensor that will allow you to make purchases on our world. When you select a mate, he will pay for whatever you buy between now and then. Once your mating is approved, you'll be added to his accounts everywhere in Terran Prime." "Thank you for explaining how everything works. I've been a little lost." He frowned. "May I ask a personal question?" "Your voice is different from anyone else I've encountered from Earth. Are you from a special region?" "I'm deaf." She pointed to her hearing aids. "These allow me to hear a little, but it's like listening to someone talk under water. I don't always catch everything. And, while it allows me to hear a little, I can't always tell how loud I'm speaking." "Understood. Perhaps, after you've found a mate, they will permit me to run some tests and see if we can restore your hearing." "I was born deaf. My mother had preeclampsia when she was pregnant with me, and I was born early. Some of the bones inside my ear didn't form correctly. A doctor tried to explain it to me once, but I didn't understand the terms he used." The doctor nodded. "Well, we'll take care of those implants today and if you decide you wish me to run tests later, then that's what we'll do." She meekly followed the doctor into a back room and stretched out on the table at his direction. He explained the procedure to her before giving her some gas to put her to sleep. When next she woke, her wrist and the back of her ear hurt a little, but otherwise she couldn't tell she'd had anything done. Charlotte found the other male pacing in the lobby. "Can you understand me now?" he asked. "I have a translator, so I understood everything you told the doctor. You're not Charity Mayweather, are you?" "Charity is my younger sister." The Terran's face flushed with anger. "Your father lied to me. He said he was sending Charity here to find a husband, not her deaf older sister." She felt shame burn through her as she realized she was about to be cast aside again. Charlotte knew she should be accustomed to it by now but it still hurt, knowing she wasn't good enough for yet one more man. "If you send me back to Earth, I'll be homeless," she said. "My father said if I didn't come here and find a husband, I would be thrown out of the house and all my accounts would be closed." The Terran muttered something, raked a hand through his waist-length hair, and then faced her with his hands on his hips. "I'm Chief Councilor Borgoz and you'll be staying in my home. You may not be the sister I was expecting, but I'm not about to leave you stranded here. Especially with your condition." The harshness of his face relaxed into an apologetic look. "I didn't mean to imply that you were stupid, but there are many dangers on a new world for anyone, much less someone who can't hear. I didn't mean to make you feel unwanted or as if you were a burden." "It wouldn't be the first time in my life I've felt that way." His gaze narrowed. "Your father made you feel unwanted?" "And my sister. Be thankful she didn't come in my place. She's a spoiled, selfish brat who always has to get her way or she screams and throws things." It felt good to be honest about her sister without fear of being punished. Everyone always treated Charity as if she was a princess, and Charlotte was tired of it. "Right. Well, let's get you settled. I'm sure you'll want more things than what you brought with you. Once you've had a chance to put your belongings away, I'll take you shopping for anything you had to leave behind." "I don't need much. As long as you have something to wash with, I'll be fine. I have enough clothes to last a week before I'll have to do laundry." "An Earth week is seven days, correct?" "A Terran week is eleven days. You'll need more clothes. Things are different here on Terran. We don't have machines in our homes to launder our clothes, and the shop in town that handles it is usually busy. You'll want as many outfits as possible." He crooked his elbow and she curled her hand around it, watching as he hefted her bag as easily if it contained no more than feathers. Charlotte tried to take in the scenery as they walked through Terran Prime. Borgoz explained that, while he had a vehicle to maneuver through the city, he thought she might like the walk to stretch her legs after such a long shuttle ride. When they reached his home, her jaw dropped as she stared at the massive structure. She'd lived in a mansion all her life, but Borgoz's home surpassed that of her father's by a fourth floor and probably another twenty feet in width. She tried not to stumble over her feet as he led her up the stairs and into his home. Charlotte looked everywhere, not wanting to miss a thing. Borgoz handed her bag to another male, and they followed him up the stairs to her room. It was twice the size of her bedroom at home with doors that opened onto a balcony overlooking a garden. It was gorgeous, and for the first time in her life she felt lucky. She was glad her father had sent her here, and had hope that her future would be bright and wonderful. She turned from the fantastic view to find Borgoz studying her. Charlotte couldn't guess his age. There were no wrinkles on his face, but the silver in his hair told her he was probably forty at the least. But then, she didn't know how Terrans aged. For all she knew, he was pushing seventy like the vile old man her father had tried to force her to marry. Borgoz was a handsome man. His purple eyes were dark like a pansy and quite beautiful. Those eyes were taking her in, and she wondered if he found her lacking like everyone else in her life. If she'd known she was coming to a palace, she may have dressed a little nicer for her trip. She tugged on the hem of her tank and wondered if she should change clothes before going shopping with him. He was being kind enough to give her a place to stay, the least she could do was not embarrass him in front of his people. "I'll come back in thirty of your Earth minutes to see if you've finished unpacking. If you're hungry, we can stop for a bite to eat while we're out and then go shopping. Don't hesitate to ask for anything you need. If you can't find me, Helio will help you," he said, indicating the other male. Borgoz gave her a regal nod and then he exited with his servant. Left alone, she quickly unpacked and changed into a pretty sundress so she would be appropriately attired for an outing with someone so important, then she spent the rest of her time admiring the view. Charlotte hoped she'd get a chance to walk through that garden and admire the petals of the vibrant flowers close up. This world was amazing and full of new and wonderful things. She couldn't wait to explore as much of it as she was allowed.